Welcome to our website. If you continue to browse and use this website, you are agreeing to comply with and be bound by the following terms and conditions of use, which together with our data policies govern Quob Stables’ relationship with you in relation to this website. If you disagree with any part of these terms and conditions, please do not use our website.  The term ‘Quob Stables’ or ‘us’ or ‘we’ refers to the owner of the website whose registered office is: Quob Stables, Durley Brook Road, Durley, SO32 2AR. The term ‘you’ refers to the user or viewer of our website. 8. Your use of this website and any dispute arising out of such use of the website is subject to the laws of England, Northern Ireland, Scotland and Wales. © 2019 Quob Stables | Created by Lagoon Ltd.